This is theme chosen by Benedict XVI for the next World Day of Peace. The "Freedom of freedoms" it is consistent in search for truth and the truth of man. This excludes the "religion" of fundamentalism, instrumentalization and manipulation of truth. Vatican City (AsiaNews) - "Freedom of religion, Path to peace," is the theme chosen by Benedict XVI for World Day of Peace 2011. The World Day of Peace – celebrated since 1968 on the first day of every year – will be therefore dedicated to the theme of religious freedom. As is well known, - said a statement from the Holy See Press Office - in many parts of the world there exist various forms of restrictions or denials of religious freedom, from discrimination and marginalization based on religion, to acts of violence against religious minorities. Religious freedom is rooted in the equal and inherent dignity of man, it is oriented toward the search for ‘unchangeable truth’, and thus can rightly be presented as the ‘freedom of freedoms’. As such, religious freedom is authentically realized when it is experienced as the coherent search for the Truth and the truth of man. This notion of religious freedom offers us a fundamental criterion for discerning the phenomenon of religion and its manifestations. It necessarily rejects the «religiosity» of fundamentalism, and the manipulation and the instrumentalization of the truth and of the truth of man. Since such distortions are opposed to the dignity of man and to the search for truth, they cannot be considered as religious freedom. Rather, an authentic notion of religious freedom offers a profound vision of this fundamental human right, one which broadens the horizons of «humanity» and «freedom» of man, allowing for the establishment of a deep relationship with oneself, with the other and with the world. Religious freedom is a freedom in this respect for human dignity and life. As the Fathers of the Second Vatican Council emphasized: "Man has been made by God to participate in this law, with the result that, under the gentle disposition of divine providence, he can come to perceive ever more fully the truth that is unchanging. Wherefore every man has the duty , and therefore the right, to seek the truth in matters religious in order that he may with prudence form for himself right and true judgments of conscience, under use of all suitable means" (Declaration Dignitatis Humanae, 3). The vocation to believe in God, recognized as a fundamental human right, is a pre-requisite integral human development (Caritas in Veritate, 29), and a condition for the realization of the common good and the promotion of peace in the world. As Pope Benedict XVI affirmed during his visit to the General Assembly of the United Nations: "Human rights, of course, must include the right to religious freedom, understood as the expression of a dimension that is at once individual and communitarian – a vision that brings out the unity of the person while clearly distinguishing between the dimension of the citizen and that of the believer" (Address to the General Assembly of the United Nations, 18 April 2008). The theme chosen for the 2011 World Day of Peace represents an accomplishment of a «path to peace» which Benedict XVI has invited the human family to consider in depth on several occasions. Since 2006, his Message for the World Day of Peace has focused on important dimensions of the truth (In Truth, Peace, 2006), the dignity of the human person (The Human Person, the Heart of Peace, 2007), the unity of the human family (The Human Family, a Community of Peace, 2008), the fight against poverty (Fighting Poverty to Build Peace, 2009), and finally care for creation (If you Want to Cultivate Peace, Protect Creation, 2010). This journey has its roots in the vocation of man to truth (capax Dei) and, having as a "polestar" human dignity, leads to the freedom to seek the truth. Today there are many areas of the world in which forms of restrictions and limitations to religious freedom persist, both where communities of believers are a minority, and where communities of believers are not a minority, and where more sophisticated forms of discrimination and marginalization exist, on the cultural level and in the spheres of public civil and political participation. 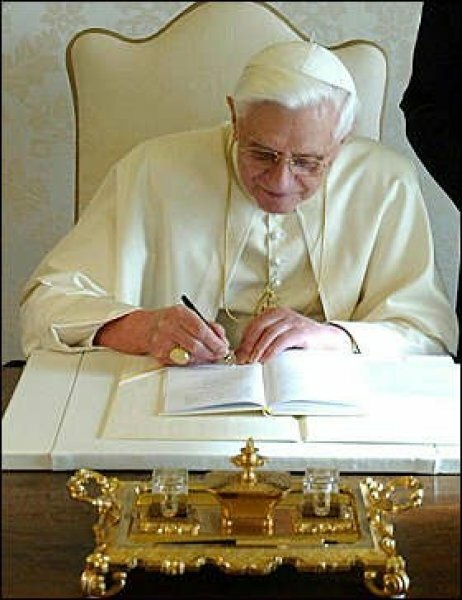 "It is inconceivable" – remarked Benedict XVI – "that believers should have to suppress a part of themselves – their faith – in order to be active citizens. It should never be necessary to deny God in order to enjoy one’s rights. The rights associated with religion are all the more in need of protection if they are considered to clash with a prevailing secular ideology or with majority religious positions of an exclusive nature" (Address to the United Nations, cit.). Man cannot be "fragmented", and separated from what he believes, because that in which he believes has an impact on his life and on his person. "Refusal to recognize the contribution to society that is rooted in the religious dimension and in the quest for the Absolute – by its nature, expressing communion between persons – would effectively privilege an individualistic approach, and would fragment the unity of the person" (Address to the United Nations, cit.). It is for this reason that: "Religious Freedom is the Path to Peace".